Holy Week is the week Christians celebrate the death, burial and resurrection of Jesus Christ. It is also called Passion Week or Easter Week. The first Sunday in the week is called Palm Sunday and the second one (the day Christ arose) is called Easter Sunday or Resurrection Sunday. 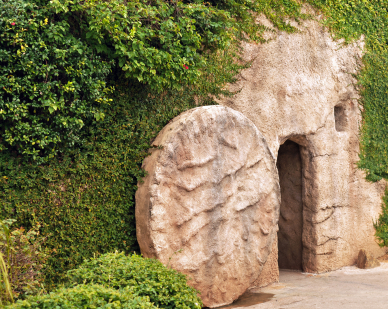 Test your Bible knowledge with these trivia questions related to Easter Week. 1. What was the Jewish feast which was being celebrated the week Christ was crucified? 2. When Jesus entered Jerusalem during what is known as His Triumphal Entry, what animal was He riding on? 3. Why is the Sunday before the resurrection called Palm Sunday? 4. Which disciple cut off the ear of the high priest’s servant in an attempt to protect Jesus from being taken as a prisoner? 5. What was the name of the high priest’s servant who had his ear cut off by the disciple and subsequently reattached by Jesus? 6. How many times did Peter deny Christ after the abandoned the Lord? 7. How many pieces of silver did Judas trade the life of Jesus for? 8. How did Judas identify Jesus to the soldiers? 9. In repentance Judas returned the money to the priests that he was given as the price of betrayal of the Lord and then did what? 10. The priests took the money that Judas had returned to them and did what with it? 11. Who was surprisingly released before Pontius Pilate sentenced Jesus to death? 12. What did Pilate’s wife counsel him to do concerning Jesus? 13. A man named Simon was compelled to carry the cross of Jesus. In Mark 15 we are told the names of Simon’s two sons. What were their names? 14. What was the inscription above the cross? 15. Can you quote 4 of the 7 statements recorded in the Bible that Christ said from the cross? 16. Following the statements of Jesus on the cross, there was a statement by a Roman soldier concerning Christ. What was it? 17. What happened in the Temple as a sign that the death of Jesus had made way for the individual believer to approach God? 18. When Jesus died there was darkness in the land. How long did it last? 19. In John 19 two men helped prepare the body of Christ for burial. One is said to have been a secret disciple and another secretly came to Jesus early in His ministry to ask question. Who were these men? 20. Who was the first person to see the risen Christ? 2. A young donkey (Matthew 21:1-7; Mark 11:1-7; Luke 19:28-35; John 12:12-15). In eastern tradition it was customary for a king going to war to ride a horse. Yet when the king was at peace he would ride a donkey. The symbolism is the Prince of Peace, Jesus Christ, was coming for purposes of peace between God and man. 3. When Jesus entered into Jerusalem at the beginning of the Passion week, the people welcomed Him as king and Messiah. They covered the road with their garments and palm fronds as a symbol of their worship and acceptance of Him as king (Matthew 21:8; Mark 11:8; Luke 19:35, 36; John 12:12, 13). 8. By giving Him a kiss (Matthew 26:47-49). 10. Bought the potter’s field with the money which is where strangers were buried (Matthew 27:6-8). 12. To leave Jesus alone because He was a just man. She had a bad dream concerning the Lord and she probably felt it would bring bad luck on the household of Pilate (Matthew 27:19). 14. “Jesus of Nazareth, King of the Jews” (Luke 19:19). It was written in three different languages according to John 19:20; Hebrew, Greek and Latin. 16.“Truly this was the Son of God” (Matthew 27:54). Slightly different statements, but the same idea are found in Mark 15:39; Luke 23:47. 17. The veil in the temple was torn from top to bottom (Matthew 27:51). We call this access to God the “priesthood of the believer.” This means that Christians can approach God’s throne through prayer without the need of a human mediator or priest. Because the veil was torn from the top to the bottom, that is symbolic that it is God who grants us access and not that we have worked our way into God’s throne room; which could be implied if the veil was torn from bottom to top. 18. Three hours (Matthew 27:45; Mark 15:33; Luke 23:44-45). From noon to 3 pm. 19. Joseph of Arimathea and Nicodemus (John 19:38-42). Interestingly, these two men did not follow Jesus as He traveled through the region, but they were there when all the outspoken disciples had abandoned the Lord. Do you have some questions that are related to what the Bible says about Easter time that you would like to share? Feel free to share the Q & A in the comments section below. Fine work here sir. I was tempted to quiz the church that I am under-shepherd of until I could not myself answer all 20 of them from memory. Great timing for this. Thank you. These are important to know and reminders of just how much He paid for us who are unworthy servants. I ran across a wonderful little Easter Men’s devotional called “Easter – Beyond the Bunny”. The writer has a very witty way, and you can see his blog at http: //alifeworthy. net. Worth a look! Great questions, Mr. Peach! Only got 16 correct, though. A blessed Easter for you and your family! i am curious, are the four you missed, Patricia, these? >#13- …the names of [cross-carrying] Simon’s two sons. Glad the answers were there! LOL! Can you explain the discrepancies, David? Why would Luke know what Jesus said on the cross, and not the others? Tomorrow is Resurrection Sunday! A glorious time for you and your family, David. For all of us, amen! Nyc write up. Gave us sth gud to thnk about. I also wonder how the Bible could tell us d words in somebody’s personal prayer. John 17 as an example except, of course, by divine insight frm above. Thanks for this great information. I teach older adults and just knew they would know all the answers, but guess what none of us did. Great lesson for the class. They always enjoy being able to participate. Thank you for this study. We used it to prepare for Easter at our skilled nursing/rehab community and it was a great way to prepare our hearts.